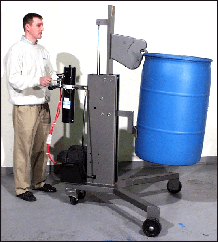 battery power drum lift to ergonomically palletize drums. jaws to grip the top rim of the drum. 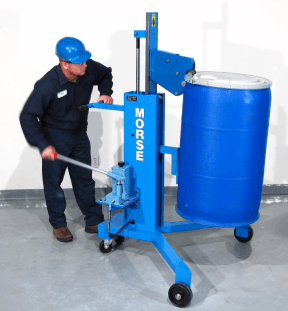 Lift a rimmed drum with a hand pump with model 82H drum mover. 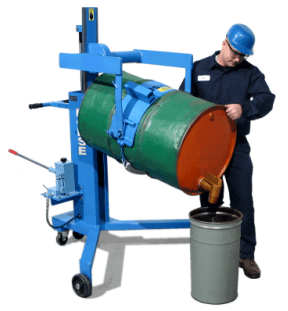 Add a Power-Lift Option for a more ergonomic means of raising a drum. Transport drums, and move rimmed drums on and off pallets up to 19" high. Lift and transport drums and barrels. Move drums on and off pallets, spill containment pallets in upright position, and drum dollies. Lift an upright drum 19" (48.3 cm) high. The V-Shaped base of these drum movers allows you to raise and place a drum at the corner of pallets. 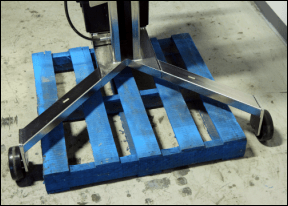 The base of the drum mover will straddle a pallet up to 41" (104 cm) wide and 7" (18 cm) tall. Equip your drum transporter with Power-Lift Options for more ergonomic means to raise drums. 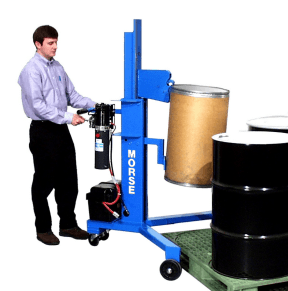 Drum movers are available with AC, DC or Air power-lift options. Model 82H-125 drum transporter / palletizer shown has battery-powered lift. 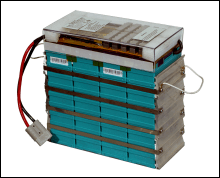 It is supplied with a separate charger. These drum movers and palletizers / depalletizers have jaws to grip the top rim of an upright drum, allowing you to efficiently lift a drum onto and off pallets and transport drum. The completely mechanical, automatic grip has wide jaws and is built to last. 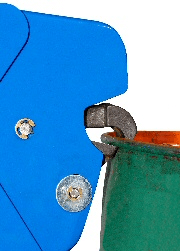 Handle virtually any rimmed steel, fiber or plastic drum. Drum Mover / Palletizer spanning 36" pallet. Stainless steel models are available with DC, Ac or air power drum lift. 82H Series drum palletizer to move upright drum. Has jaws to grip drum top rim. 82A Series lift, pour and palletize drum. Has band drum holder around drum. 82H Drum Transporter / Palletizer / Depalletizer with Hand Pump Drum Lift 456 Lb. (207 kg) L50" W50" H56"
82H-120 Drum Transporter / Palletizer / Depalletizer with AC Power Drum Lift 1-Phase/115V/60Hz, TEFC 525 Lb. (239 kg) L50" W50" H56"
82H-124 Drum Transporter / Palletizer / Depalletizer with Air Power Drum Lift 440 Lb. (200 kg) L50" W50" H56"
82H-125 Drum Transporter / Palletizer / Depalletizer with Battery Power Drum Lift * 12V, DC * 512 Lb. (233 kg) L50" W50" H56"
82HM Drum Transporter / Palletizer / Depalletizer with Hand Pump Drum Lift, and Spark Resistant Parts 448 Lb. (204 kg) L50" W50" H56"
82HM-124 Drum Transporter / Palletizer / Depalletizer with Air Power Drum Lift, and Spark Resistant Parts 440 Lb. 82H-SS Stainless Steel Drum Transporter / Palletizer / Depalletizer with Hand Pump Drum Lift 456 Lb. 82H-SS-120 Stainless Steel Drum Transporter / Palletizer / Depalletizer with AC Power Lift Drum 1-Phase/115V/60Hz, TEFC 525 Lb. 82H-SS-124 Stainless Steel Drum Transporter / Palletizer / Depalletizer with Air Power Drum Lift 440 Lb. 82H-SS-125 Stainless Steel Drum Transporter / Palletizer / Depalletizer with Battery Power Drum Lift 12V, DC * 512 Lb. 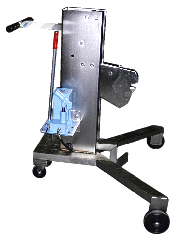 4725-P Kit to convert 82H Drum Mover / Palletizer to 82A Drum Palletizer that Pours 126 Lb. (57 kg) L37" W33" H37"
Mobile Drum Lifters / Drum Transporters / Drum Palletizers. 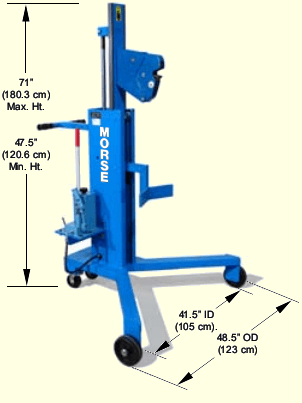 Morse drum movers and drum palletizers to move rimmed drums on and off pallets up to 20 inches high. Pallet loading barrel movers.